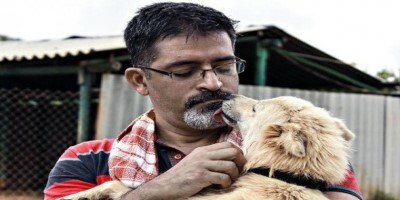 Rakesh Shukla is a software engineer from Bangalore, who’s found his life’s calling in looking after dogs that no-one wants…at last count, Mr Shukla had 735 dogs. There are Labradors on his farm, there are Golden Retrievers, Great Danes, Beagles, Dachshunds, Rottweilers, Saint Bernards and even a pug. There are hundreds of mongrels too. Most of the dogs are strays, the others have been abandoned by their owners. The latest arrivals were a group of 22 pedigreed dogs whose owner, a city businessman, was shot dead recently by criminals. Whenever he met a stray or abandoned dog, he brought it home. Initially he kept them there but when his wife protested, he moved some of them to the office, where the top floor was turned into a home for dogs. In 2012, Mr Shukla bought land and set up his the farm – a haven for dogs that are old, ailing or simply unwanted. In the past year though, he has run into problems with some animal activists, who have demanded that they be allowed onto the farm. He has also faced complaints that he is creating public unrest by keeping so many dogs. There have also been demands that he shut down the farm – but he has refused to concede.